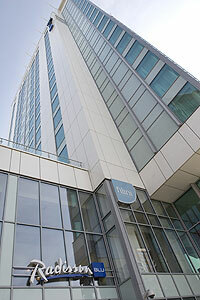 The Radisson BLU hotel is one of Cardiff's newest hotel, having opened its doors for business in June 2009. This brand new hotel offers 215 stylish guest rooms, a restaurant & bar, meeting & event facilities and leisure facilities. All guest rooms are equipped with LCD televisions, free high-speed Internet access and individual climate control. The Radisson BLU is one of the closest hotels to the Cardiff Motorpoint Arena, being only a short 5 minute walk away. Standing towards the back of Cardiff city centre this impressive glass and metal skyscraper has made an immediate impression on the city's skyline. Guest rooms on the upper floors enjoy fantastic views across the city and towards Cardiff Bay. Central location - close to shops, theatres, bars and restaurants. Filini Bar & Restaurant serves authentic Italian food, great wines and classic cocktails. Limited onsite car parking for guests - charged at £12 per 24hrs. Nearby NCP car park also offers a concessionary rate of £12 per 24hrs for guests. Flexible meeting rooms covering 550 square metres.